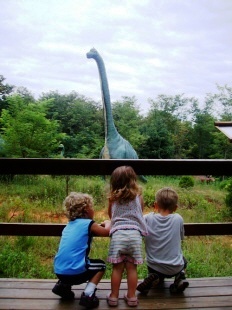 Florida: Orlando Area Family Fun and Deals from Flash-frozen Ice Cream to Dinosaurs. There is something magical about discovering a dinosaur. Taste magical ice cream anyone? Pure Magic Ice Cream Parlor in Kissimmee features scrumptious, tempting and unique ice cream made to order on the spot! Choose as many flavors from among dozens of add-ins, then watch as it is added to a vanilla base and flash frozen with liquid nitrogen, creating a rich and creamy ice cream under a beautiful cloud of vapor within seconds and mixed by a friendly staffer. Bonus points: If it is essential to eat a meal before having dessert, the parlor also offers pizza and hot dogs. The family-friendly atmosphere nurtures free-form thinking. Guests are encouraged to create chalk masterpieces on the concrete floors and kids may run off some of the sugar on the playground equipment. Area Get all wet with an “After 2 p.m. Pass.” SeaWorld’s acclaimed waterpark, Aquatica, launched Omaka Rocka, which means “rocking river.” The new ride features half-pipe maneuvers through three funnels and provide near weightlessness for riders aboard the two-seater floats. Riders in the two-person rafts must be at least 48 inches tall. The park also has introduced the “After 2 p.m. Pass,” which allows admission for the rest of 2010 in the afternoon for $49.99 (just $2 more than the regular cost for a one-day pass). Make it happen. The Kissimmee website frequently posts special vacation offers ideal for families. To stay in the information loop sign up for the free e-newsletter, checkout Kissimmee/St. Cloud on Facebook or follow the latest news on Twitter for more deals. To explore all of the options log on to www.VisitKissimmee.com.